Unit is 120” wide x 81” deep x 126” tall. Custom designed unit disassembles into halves for transport via freight elevator. 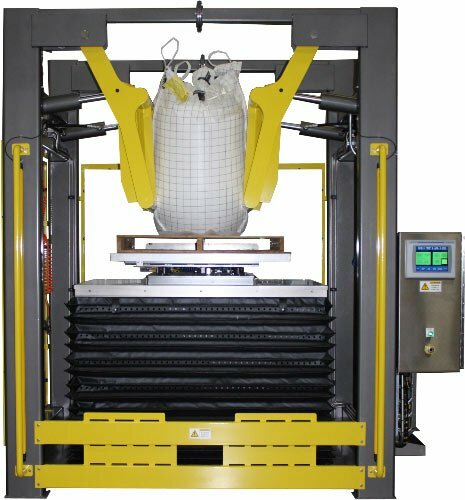 Unit features a tubular steel rotary-lift table guard on the load side of equipment designed to provide additional protection during loading and unloading. Clear acrylic guarding package with load side light curtain for operator safety. NEMA 4X electrical enclosure with fused disconnect. Automated control package includes an Allen-Bradley PLC with PanelView Plus 1000 touch screen operator interface allows operator easy access to bulk bag and material conditioning parameters, system status, and manual mode controls.